If you are feeling tired or are jetlagged after a long trip, Ceremony Coconut & Lemongrass aromatherapy candle is sure to re-energize you and get you up on your feet faster than ever. Coconut oil is used in aroma therapy to improve blood circulation, vigour and vitality. The citrusy fragrance of lemongrass is an instant energy booster and mood enhancer. The tangy citrusy smell of lemongrass essential oil and coconut oil when combined in the rich and creamy soy wax, makes an aromatherapy candle that provides instant boost of energy. The slow burning and long lasting candles come in beautiful and very chic glass containers. Each candle weighs 100 gms and will burn continuously for up to 23 hours. It releases its special fragrance as it burn and wafts through the room to keep it smelling fresh and pleasant for hours after it has stopped burning. 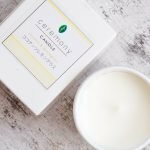 If you are feeling tired or are jetlagged after a long trip, Ceremony Coconut & Lemongrass aromatherapy candle is sure to re-energize you and get you up on your feet faster than ever.